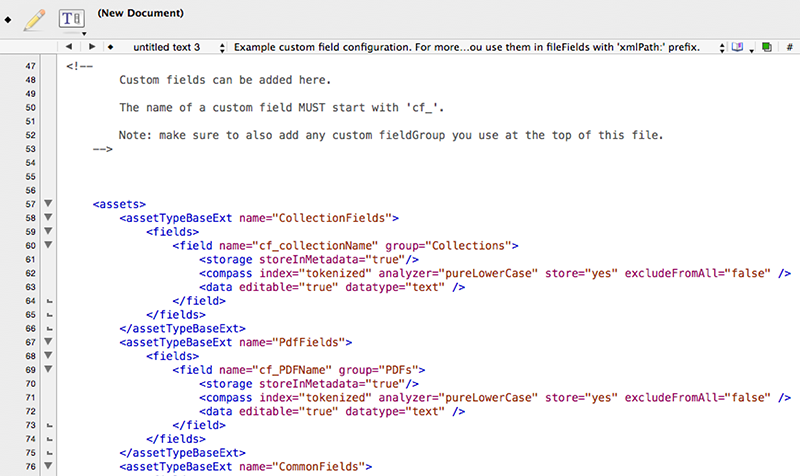 The custom-assetinfo.xml file is used for changing the settings of default metadata fields and for creating custom metadata fields. Over time this file can get very complex and potentially confusing. To keep the file readable for yourself, your customers or your colleagues who work on the installation, you can structure the file in various ways, depending on your needs and personal preferences. Below are some guidelines that you might find useful. The first tip is more to do with readability than with the structure of the file itself. The configuration page displays the content of the file as plain text without any syntax coloration. Best practice is to copy the content to your favorite text editor such as TextWrangler or Notepad++ so that you can easily read and edit the configuration settings. 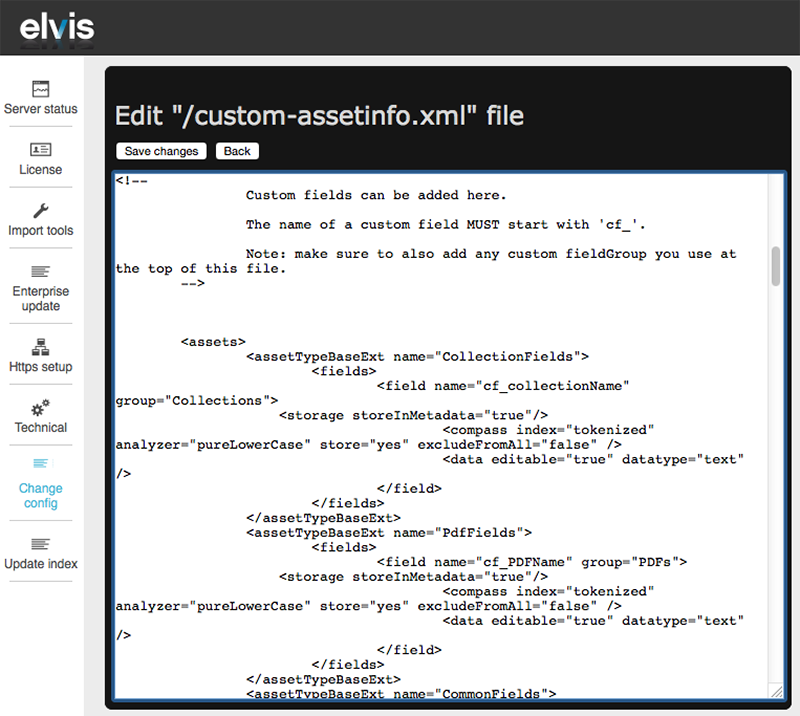 When finished editing, paste the content back into the Elvis page. Figure: The difference between viewing the custom-assetinfo.xml file in the Elvis 6 configuration page (top) and viewing the same code of the file in TextWrangler (bottom). Adding comments is an essential way of keeping track of how an option works, how it should be used and why it was implemented. Be as complete as possible so that even when reading it a year from now it is still clear and comprehensible. To increase the readability, write full sentences and try not to use abbreviations. One downside of using large sections of comments is that they can obscure small sections of code, especially single lines of code. You might want to first define all the code for a particular section and place the comments below it or place all comments at the bottom of the file. To separate each section you can use clear dividers, for example by using (multiple) lines of (multiple) special characters, and text written in capitals. Examples are a great way to learn about features that you have never used before but once you are familiar with them these examples can get in the way and reduce readability of the file. One way of dealing with this is to store all examples in a separate file and to make sure to clearly name this file as such. Then, use the custom-assetinfo.xml file for storing only the configuration that is used in production.